Vacation rental house. Sleeps 7, 3 bedrooms, 1 bathroom. No pets allowed. You will love all the grassy yard for the kids to run and play in! The kids will love the shed turned play house! The kids will love their own little hang-out to play games in. The perfect place to relax and watch the kids play. 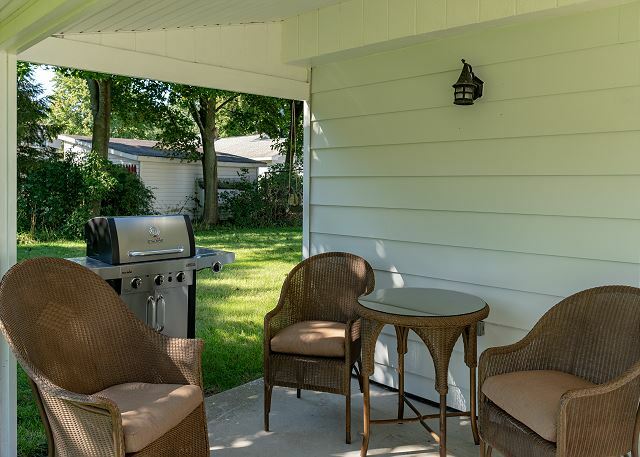 Sit and relax while you grill up some dinner on the gas grill provided for you. 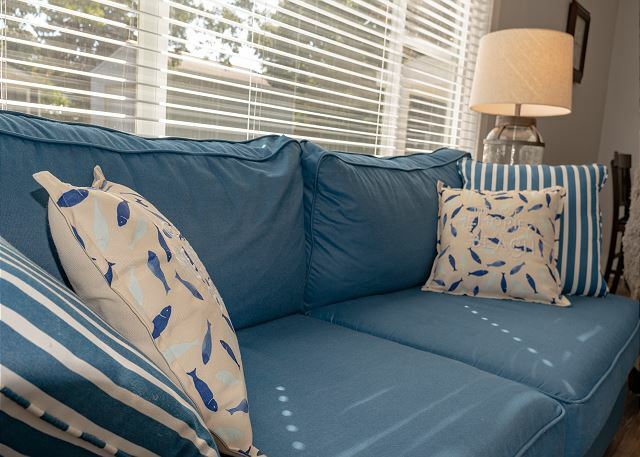 You will feel right at home the moment you walk in-tastefully and simply decorated! This will soon become your Happy Place too! Bring along your work if you have to! With a desk and high speed internet, you can vacation and work at the same time! 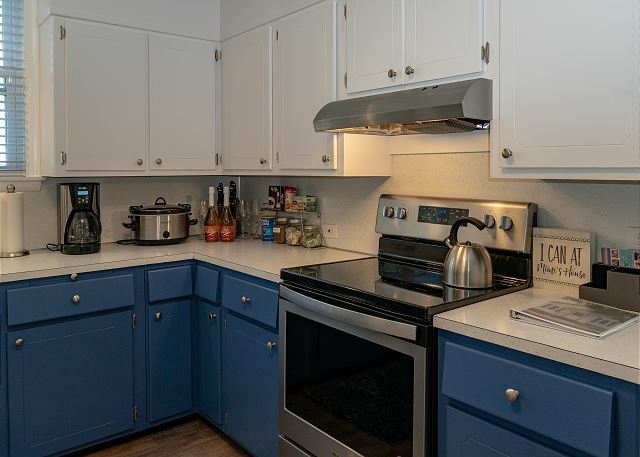 The kitchen is fully stocked with everything you will need to prepare meals right from the convenience of your vacation home! You will love all the extras the owners thought of to assure you thoroughly enjoy your vacation! 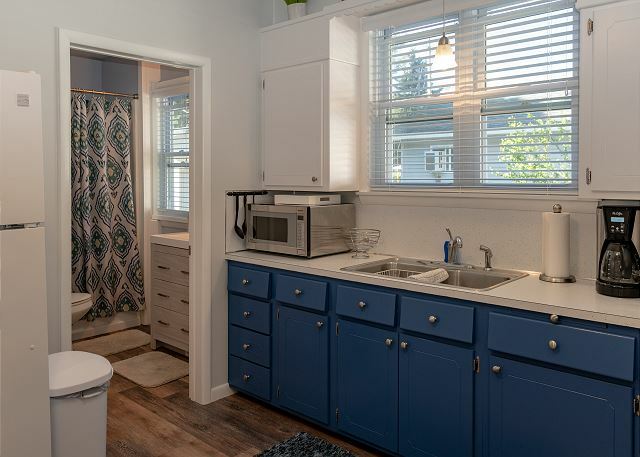 Full bath with tub/shower combo. Bedroom #2 is conveniently located off the living room and has a Queen bed. 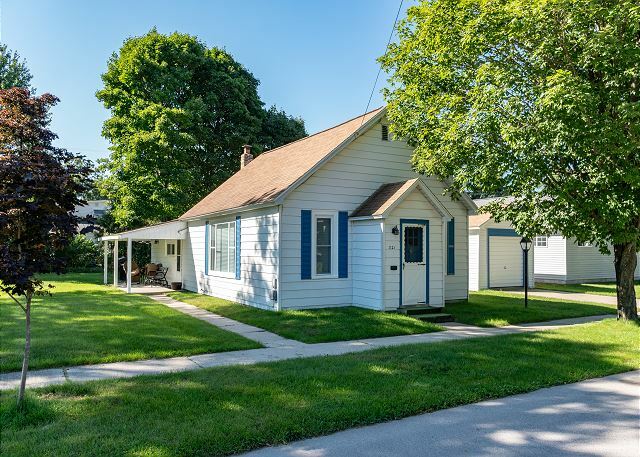 This adorable remodeled home is located just steps from Lake Michigan and has everything you need to make you feel right at home. 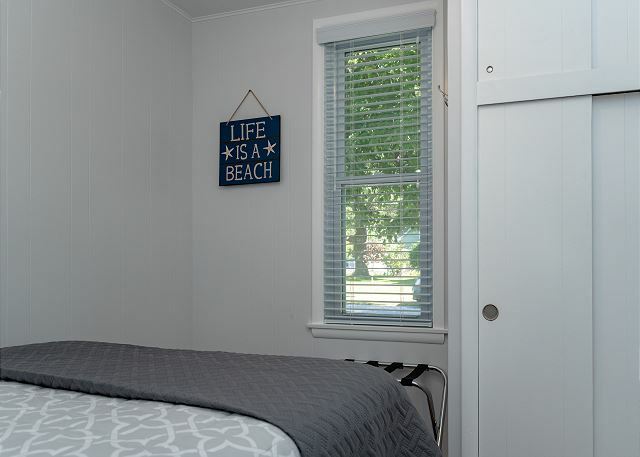 It boasts main floor living with three bedrooms and a full bathroom, all wood floors, new furniture, a fully stocked kitchen, and is tastefully and simply decorated. A washer and dryer are located in the basement. A Roku is also provided along with cable television for your convenience. Please note this home does not have central Air Conditioning. A ceiling fan and bedroom fans are provided. One of the greatest perks of this vacation home is the beautiful yard for the kids to run and play in. Your kids will also love the shed turned kids play area! Loaded with fun things for kids to play with and even a table to play games at, you will have a hard time convincing the kids to leave and explore the beautiful town of Manistee! The adults will love the outdoor covered patio with comfortable patio chairs to relax in and catch your breath. A gas grill is also provided for making meals right from home. Parking: Park in the driveway or alongside the road. This home sleeps 7. All bed linens and bath linens are provided. The kitchen is fully stocked with everything you could imagine including cookware, dinnerware, and utensils. 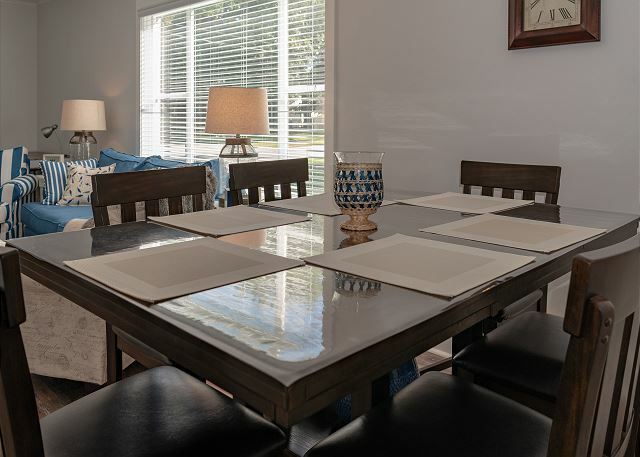 The dining room is just outside the kitchen and comfortably seats six. A standard drip coffee pot is provided. 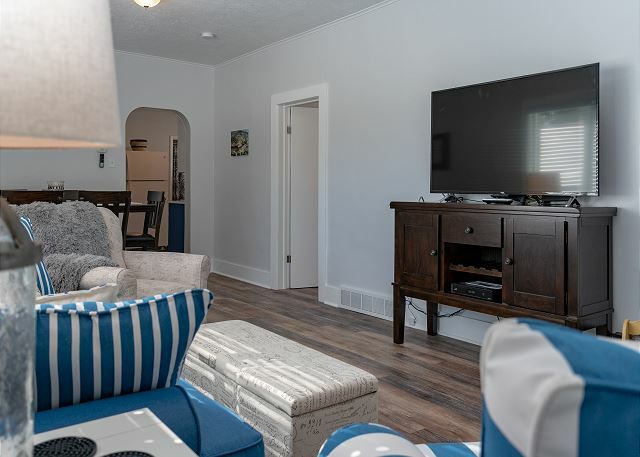 Located in a neighborhood, this home is in near proximity to everything. Bring your bikes and bike into town, or ride down to the beach. 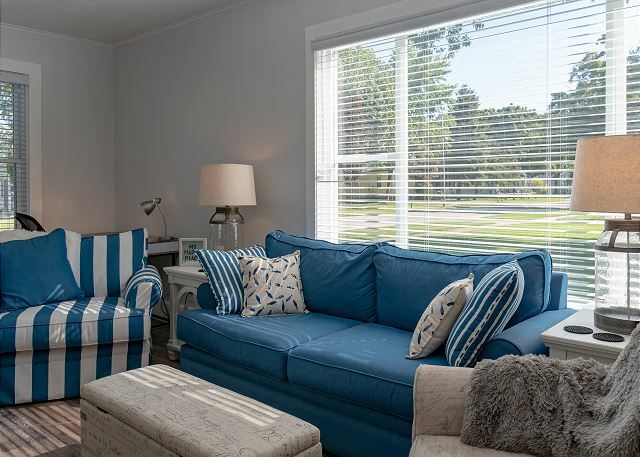 Manistee boasts water views around every corner! Take a walk along the Manistee Riverwalk and enjoy watching the boats going in and out of Lake Michigan. Take a walk on the sandy shores of Lake Michigan and walk the pier out to the Lighthouse. Head downtown for some shopping at the boutique-like shops and enjoy some good food at any of the great restaurants. You won't be at a loss for things to do in Manistee!